I’ve taken to calling CBD-Rich products “CBD-eezy,” which, for me, is a combination of the easy, breezy, beautiful Cover Girl slogan and the take-it-easy effects associated with CBD. Correct. CBD is non-psychoactive so you’re unaware of all the work this little compound does behind (your) scenes. It’s a superb healing agent that can help you feel like the star of your show by reducing inflammation, anxiety, and other pains preventing you from living your best life. I kept hearing about the futuristic, gorgeous dosist Calm CBD pen and it’s many accolades for its modern design, recyclability and groundbreaking battery technology, making it one of Time Magazine’s Best Inventions of 2016. Will the disposable CBD pen live up to all the praise? We’ll find out in this in-depth evaluation. The preloaded CBD pen comes in a sleek yet simply designed charcoal blue box. The bar graph on the back of the sturdy box represents the levels of THC, CBD, accessory cannabinoids and five major terpenes in a visually stimulating way, which is a rare packaging find. I just wish the graph had a numbered representation and the “accessory cannabinoids” were explicitly revealed. The dosist packaging also includes the THC and CBD milligram content, lot number, manufacturing and expiration dates, and other compliance info. 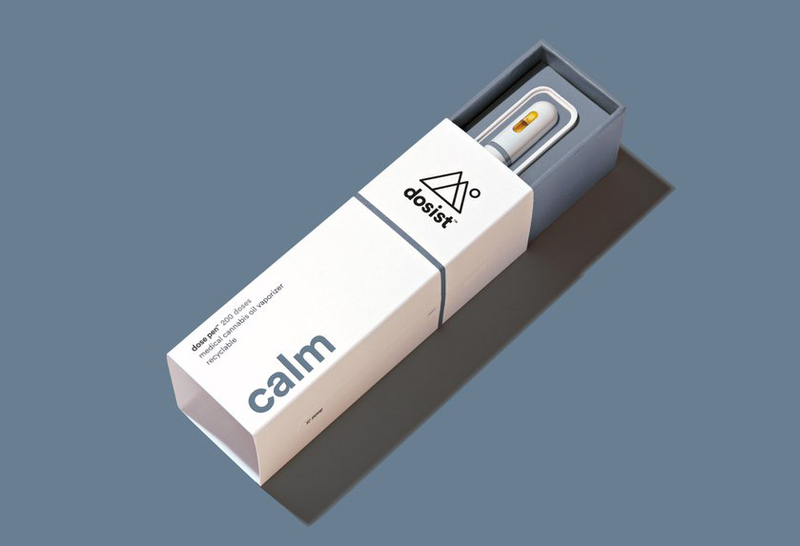 The dosist calm pen comes encased in a tamper-proof, see-through plastic container. Inside, the white cylinder just a little wider than your pinky finger that’s compatible with the iPhone generation’s style expectations. The design is discreet, though it’s also something you want to be seen using. I’d feel slick using it at a show or another public event. Not only does this dosist pen hit smooth, but it also vibrates! The same constant formula and airflow create a consistent, delightful experience that I appreciate. Oil quality is the second half of the equation, and I look for cartridges and disposables with thick, golden oil. Dosist Calm certainly delivers, though with a slight cloudiness that made me raise an eyebrow. As soon as I took my first “dose,” the sweet and sour cherry flavor indicative of CBD (I don’t know why CBD has that flavor) hit my tongue and made my mouth water. It’s easily one of my favorite flavors, as the oil used in the dosist Calm pen showcases the terpene profile beautifully. Every pen is designed with its own state-of-the-art recyclable battery – a nice gesture toward Mother Earth. However, each battery is very much its own animal, and getting accustomed to each dosist pen’s particular quirk takes a bit of finessing (i.e. learning how much you need to “pull” to get a hit). Before trying this, I was feeling anxious. After taking the three suggested doses an hour for experience cannabis users, my anxiety immediately subsided. Still, this recommended calm dose was too little for me. Given its efficacy at helping handle my anxiety, I’d give this product five out of five stars if I could gauge my own doses and take larger puffs at a time. This CBD-rich formula provides focused clarity, which isn’t so much of a “high” as it is a nervous-system soother. The suggested “3 doses/hour for experienced cannabis user” was much too little for me. You’re paying more for the pen’s proprietary design and technology than for the vape oil inside as this “50 dose” only provides .185 grams of CBD oil. I’m used to paying the same price for a 1g Delta 9 1:5 THC:CBD cartridge. It’s not a cost-effective way to regularly consume cannabis, but if you need just a bit to feel the effects or are new to cannabis, this is a solid entry-level pen–if you don’t mind spending a little extra. Slipcase includes vape pen and instruction pamphlet. Pamphlet contains detailed info: how to use, dosage, tips, warnings, recycling instructions. Helpful bar graph that reveals cannabinoids and terpene profile. A numbered representation on the graph would give this a 5. Pre-filled, CBD-dominant “dose pen” is a unique and innovative way to consume cannabis oil. Allows for precise dosing, shuts off after you’ve medicated. Delicious sweet and sour cherry flavor that stimulates my palate and makes my taste buds do backflips. As smooth as it gets. You might not realize you’ve taken a hit until you’ve exhaled or you feel the pen vibrate. Thick golden oil with minor cloudiness. State-of-the-art recyclable battery is a plus. Provides the exact dosage each time. Can’t always get the perfect pull on the first attempt. Felt anxiety subside immediately after taking the suggested dose. Dosage was too low for me; I needed more. Would be a 5 if I could gauge my own doses or take larger single puffs. Top-notch consistency, giving you the same formula and dosage each time. Has only .185 grams of CBD vape oil; the majority of the average $50 cost is for the fancy battery and packaging. Not affordable for the regular cannabis consumer. With its elegant design, accurate dosing, vibration, dependable formula and fruity sour taste, the Calm pen by dosist sets the bar high for vape pens by creating a dependable experience I can trust. While the hefty price for so little CBD vape oil isn’t worth it if you’re a regular cannabis user or want more bang for your buck, it’s ideal for small and accurate dosing. If you live in the Los Angeles area and are ready to try dosist’s Calm pen, click here to see if Nugg Club delivers to your address!